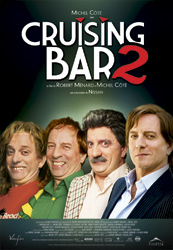 The Cruising Bar stars are back in a sequel made some 19 years after the original Cruising Bar. 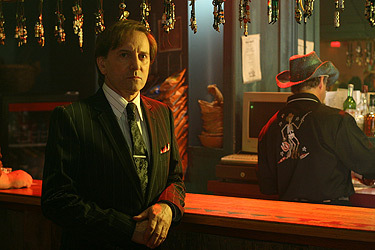 Michel Coté turns in a tour de force performance playing the four main lead characters as seen in the poster. They are Gérard the Bull, Jean-Jacques the Peacock, Patrice the Lion, and Serge the Earthworm. All are facing mid-life catastrophes. The Bull suffers erectile dysfunction when his wife (Véronique Le Flaguais), fed up with his seedy infidelities, kicks him out of the house. The impeccably groomed, narcissistic Peacock, unable to satisfy his sterile GQ magazine idea of romance, discovers that he might be gay. Meanwhile, The Lion loses his girlfriend and screws up his job as a movie stuntman, just as the lonely Earthworm goes online in a desperate bid to find his dream woman. The movie climaxes with the foursome back on the bar scene, a contemporary one that they don’t really grasp, hoping to find the someone who will ease them out of their troubles.